The global wind industry continues to break records for new investments and capacity, but high costs remain a major challenge. As the fastest-growing part of the sector, the offshore wind industry is finding new ways to design smarter turbine foundations to help ensure a renewable – and affordable – future. Towering above the sea surface, offshore wind turbines with wingspans the length of two Airbus 380s can be a fascinating sight. Deep down at the bottom of the sea, however, advanced machinery forms a vital basis for wind energy production. Anchored in the seabed and shaped like an upside-down cup, the suction bucket foundation uses negative pressure to withstand the extreme weight of the superstructures above sea level and the enormous horizontal loads exerted on the support structure by the wind turbine and waves. This type of jacket foundation has a bearing capacity able to support turbines even in weak seabed soils, thus enabling the structures to resist external loads such as strong currents, collisions and harsh weather. At the same time, it helps meet one of the offshore industry’s biggest challenges: costs. According to a 2015 report by the Oxford Institute for Energy Studies, the offshore wind industry has to shed 26% of its capital and operating costs to become “highly competitive” with other energy sources by 2023. The high costs of planning, fabricating, installing and operating large and remotely located structures are the main reason that wind still covers only 11.4% of total electricity consumption in the EU, despite another record-breaking year in 2015, according to Jan Matthiesen, Director of Offshore Wind at the London-based advisory organisation Carbon Trust. “The industry needs to be more competitive. We’re on the right track, as we’re starting to grasp the size and scale of wind farms and get more certainty by securing funding as well as gaining clearer policies,” says Jan Matthiesen, who is also responsible for the Offshore Wind Accelerator, a collaborative RD&D programme aiming to reduce industry costs. In an attempt to produce more stable and more efficient wind power, companies are constantly designing bigger turbines and moving into deeper waters farther offshore. This reinforces the need for cost-efficient foundations able to withstand larger loads and more extreme weather, including large waves but also earthquakes and hurricanes. It takes something extraordinary to resist 25-metre waves and make turbines last for 25 years. The industry is continually looking for new ways to optimise resources while strengthening structural robustness. As a company, we’ve been helping to solve this complex challenge by optimising foundation designs for the past 30 years. We’re eating the elephant one bite at a time. Offshore wind farms are still predominantly built on monopiles consisting of a large steel pipe, five to eight metres in diameter. However, as turbines grow and are installed at greater sea depths, jacket foundations with lattice designs using thinner pipes are emerging as a lighter and more adaptable option in some waters. For the past 20 years, suction bucket jackets (SBJ) have been used for oil and gas platforms. 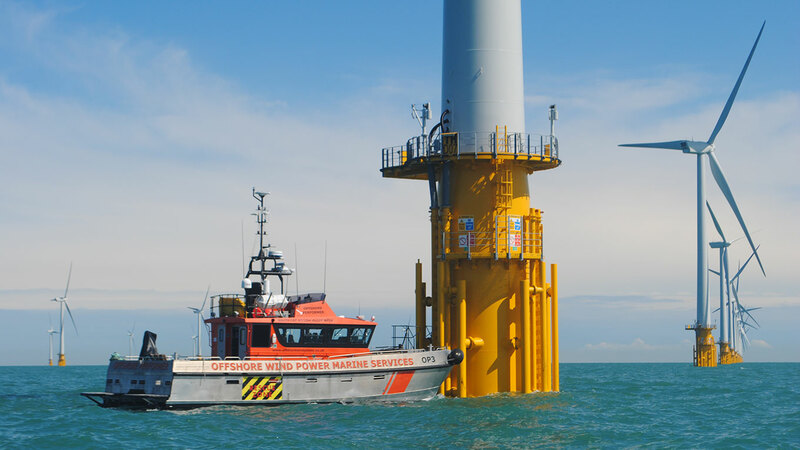 In 2014, DONG Energy installed the first three-legged SBJ technology at an offshore wind farm, the Borkum Riffgrund 1, 37 km off the German island of Borkum. The installation was quicker, cheaper – and even quieter. Having designed more than 2,400 foundations for 40 offshore wind farms, Ramboll has an over 65% market share of offshore foundations installed worldwide. Whatever type of structure is involved – the monopile, concrete gravity base, traditional jacket design or a jacket with suction piles – the focus is on improving form and functionality. A major challenge is to gradually decrease the number of tonnes of steel used per installed megawatt. We’re doing this by simplifying jacket designs, and the resource savings also reduce costs for welding, loading and installation. The Oxford Institute for Energy Studies projects that larger turbines and more competition across the value chain would have the greatest impact on reducing costs between now and 2020, in combination with investments in serial manufacturing of substructures. “Innovative foundation designs are critical in lowering costs for the whole industry, especially if you look at the potential to reduce the amount of steel and gain a better understanding of wind conditions and wave behaviour,” he says. In 2015, the world set a new record for wind capacity, adding 63.7 GW of capacity. The growth rate was 17.2%, and the total capacity is now 435 GW. Wind is the fastest-growing power source in Europe, representing 44% of all new investments in 2015. Offshore wind power installations represented 24% of the EU wind energy market in 2015, up from 13% in 2014. China is the global leader in wind power, with a market share of 51.8%. In Europe, Germany and Spain have the greatest capacity, while the UK accounted for 48% of new investments in 2015. The European Wind Energy Association (EWEA) believes the export potential is great, especially for countries like Denmark, Germany, the Netherlands and Poland, all of which are big suppliers of offshore wind foundations.